Modelling software for 2D & 3D coordinates. You need to buy a licence to use most of Yenka Mathematics in school, but Yenka Coordinates is completely free. follow the instructions to download and install Yenka. At home, remember you can use all of or Yenka products free of charge. Yenka Mathematics' modelling tools make it straightforward to investigate 2D and 3D coordinates. Even better, you can use this section of Yenka Mathematics free in school as well as at home. Coordinate Games - either place a point, given its coordinates, or enter the coordinates of points on the screen. Yenka will let you know if you've got it right, and then automatically generate a new game for you to play. Create your own games - choose how the axes are set up - 2D or 3D, one quadrant or 4, units and scales, and so on - and add 3D objects, like those from Google's Sketchup Warehouse. 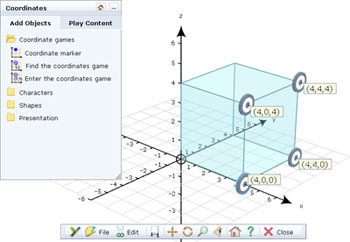 Work in full 3D - add a third axis to learn about coordinates in 3D. Drag a 3D shape onto the screen, and you can attach points to any of its vertices.